It started in October 1993 with a ski accessory mail order catalog called Sno-ski. The offices and warehouse were located in the basement of the owners home. 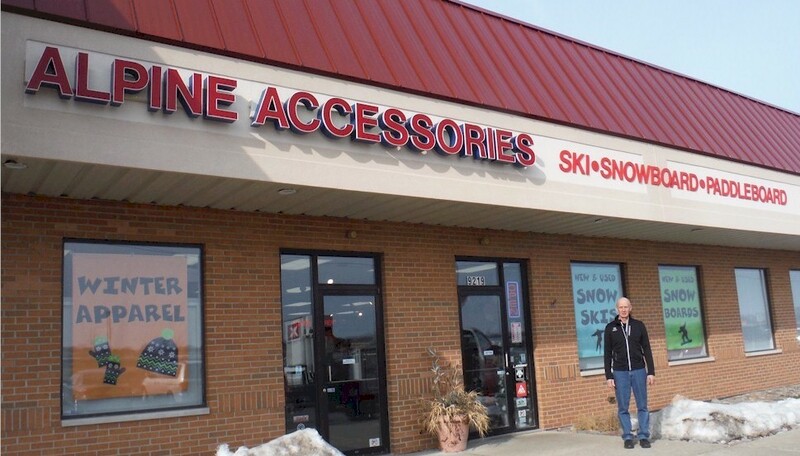 In the summer of 1995, Alpine Accessories started their first web site called Sno-ski.com. On-line sales quickly out sold the catalog sales so catalogs were discontinued at the end of 1996. From1997-1999, we expanded product selection to include snowboarding and other winter accessories. In 2000, we changed our name to Alpine Accessories which reflected the products we offered. In October 2003, we opened our first store in Algonquin, IL. It was small and could hardly fit our customers. So in the summer of 2005, we moved into our current location in Lake in the Hills, IL. With the larger store, we were able to increased our product selection and quickly found us growing again. We did some remodeling in the summer of 2008, but knew we needed more room. Our biggest expansion came in the summer of 2011when we doubled the size of our store and warehouse by expanding into the building next to us. We took down the wall between the two units and remodeled to make it look as one store. Our expansion gave us the room we need and allowed us room to start our Stand Up Paddleboard summer business. In the summer of 2015, we erected the Board House for stand up paddleboarding and sailboarding. The Board House is the largest stand up paddleboard facility in NE Illinois for rentals, lessons, and more. Alpine Accessories has a full service department offering binding installations and adjustments, ski and snowboard tuning, hot waxing, repairs, custom boot fitting and tuning lessons. Many shops send out their service work but our service department is located on-site in our backroom. This allows us to give you quick turn around, usually within 48 hours, and we believe we're able to control the quality of the work more. Alpine Accessories offers 3 levels of tuning, a type 1 (novice), type 2 (intermediate) and type 3 (advanced to expert). We found skis and snowboards behave better when they are tuned to the performance level of the skier and boarder, not to the performance level of the equipment. Tunings start at $39.00 and go to $59.00 depending on the work you need. We often get asked, "How often should I have my equipment tuned? Novices should have their equipment tuned after every 7-9 days on the slopes and wax every 3-5 days. Intermediate to advance should have their equipment tuned after every 5-7 days on the slopes and hot waxed every 3-5 days. Advanced to experts normally tune their equipment after every 3-5 times out on the slopes. Our service technicians are certified to install, adjust and test all major manufactures bindings. Whether you purchase your equipment from us or somewhere else, we can do the work. We work on alpine skis, snowboards and cross country bindings. How often should you have your ski bindings tested? The ski binding manufactures recommend to have your bindings tested every 15 to 20 days of use or every other season. Remember to bring your boots because they are required to test your bindings. Our experienced boot fitters are trained to do many boot fitting needs including custom insoles. If you have uncomfortable boots, we can usually help you. Many times we're asked,"Do I need custom insoles?" Many boots have good insoles from the factory so not everyone may need a custom insole. But a custom insole can help with comfort and performance because it is formed and fitted to your foot! Because novices have different needs than experts, we offer 3 levels of custom insoles from Comformable. Our custom insoles start at $50.00 and go to $150.00. For more info, please call us at 847-854-4754. You can rent a complete package from 1 day to a complete season and anywhere in between. Rental prices start at $29.00. A common question asked is "How many days can I rent?" It just happens our most popular rental is a kids seasonal rental where you get skis, bindings, boots and poles for the season starting at $159.00 per season. The advantage for a seasonal rental is the kids never out grow their equipment. Even if their feet grow during the season, we'll resize and adjust the bindings for no charge! For further information on our service or rentals, please contact us at 847-854-4754.